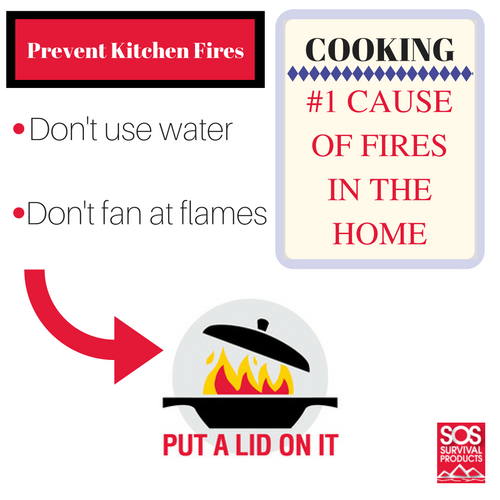 The National Fire Protection Association has declared October 9–15, 2016, to be National Fire Prevention Week, and SOS Survival Products is here to help pass some important facts about fire safety on to you. Whether you're reading this post in October or March, fire safety remains relevant; becoming aware of the statistics, learning how to prevent fires and knowing what to do in the event of a fire could save your life. If you're of the opinion that you're unlikely to be affected by a fire, think again. According to the NFPA, 80 percent of fire deaths occur in the home. Fires are more likely to happen in familiar surroundings because we're much more likely to act careless there walking away from cooking items, lighting candles and smoking are just three of the leading causes of home fires that destroy roughly $7 billion in personal property and claim more than 2,500 lives every year. According to the Red Cross, 36 people will be injured by fires daily in 2016; seven deaths in the United States will occur as a result of fires before the end of the day. Don't become next year's statistic. Discover how to prevent fires and learn what actions to take should a fire occur in your home. Cooking is the single leading cause of house fires in the United States year after year. From grease fires to simply forgetting you've left the stove on, a kitchen fire can quickly become uncontrollable, creating a fire large enough to consume your home in just minutes. Don't cook late when you're tired or have been drinking. Don't leave the kitchen area when you're frying, grilling or broiling. Remain in the home when anything is on the stove, even if it's only simmering. Keep items such as dish towels and oven mitts away from the stove top at all times. 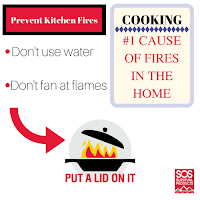 Should a fire occur on the stove, use a lid to cover and smother the flame. Don't use water. Don't try to fan the flame away. If a fire starts in your oven, turn the oven off and keep the door closed! If at any time you feel like you're no longer in control of the fire, leave your home at once and then call 9-1-1 for help. Being prepared in the event of a fire is crucial. Proper preparation can help put time back on the clock when you'll need it most and help you and your family escape as quickly as possible from a life-threatening situation. A functioning smoke detector is your first line of defense when it comes to house fires. 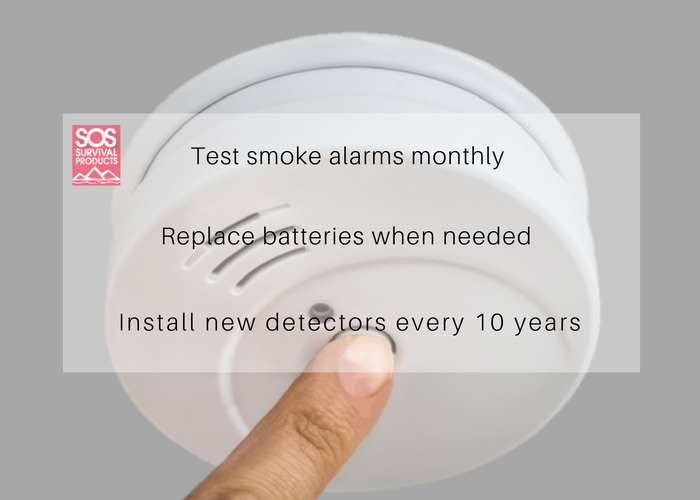 Smoke detectors help alert you and your family of smoke or fire oftentimes minutes before you're aware of a problem and are a vital life-saving asset. Keep smoke alarms up to date. Test smoke alarms and replace batteries as soon as an alert occurs. Replace smoke alarms every 10 years no matter what. Get monitored smoke alarms through a home security company. All homes should be equipped with a functioning smoke detector upon your move-in date, but how often you test your smoke alarm and how well you keep it functioning is up to you. Some homes, apartments or condos may additionally be equipped with sprinklers. If your home does not have a sprinkler system, it is recommended that you install one yourself. Safety sprinklers can reduce your home insurance premium, are easy to maintain, remain effective in all climates and reduce the risk of dying in a fire by about 80 percent. In addition, SOS Survival Products recommends you keep a fire extinguisher in every major room and equip your home with a foldable emergency ladder to allow for a safe escape from second- or third-story windows. In the event of a fire, time is everything. Don't wait for a disaster to occur before you start planning. Know what you'll take with you. Never turn back into a fire. Fire prevention and safety awareness is a valuable tool. Pass it on. Share this post with your friends and family or comment below to add your own prevention tools, tips and stories for others to hear.